So, yeah. It was another one of those “why not”moments. I do love my salty and my sweet together and I couldn’t think of a better combination than a riff on my favorite candy bar of times past. The tofu keeps it from being cloyingly sweet and gives the dessert a custardy texture. I took some pieces from this very same block and passed them along to a couple of local vegan friends and I was given two enthusiastic thumbs up. Make the caramel by adding the yogurt and brown sugar to a pan and bringing to a bubble while stirring over medium heat. Add the vanilla extract and salt and allow to cook for a few minutes. Take off the heat and set aside to cool. Make the tofu as per the recipe with one modification. Rather than directly ladeling the curd into the tofu mold, add a stage wherein you ladel it to a separate cheesecloth draped colander set over a bowl beforehand. This will remove the majority of the whey and will prevent your filling layers from being washed out. Ladel out drained tofu to an inch depth in the mold. Drizzle on some caramel and sprinkle with peanuts and chocolate but do not completely cover the layer. [ If you completely cover the layer then later when slicing, the tofu will not hold together well as the layers will slide off one another. You need some tofu-tofu contact for structural reasons.] Add the next layer of tofu. Continue this twice more and end with a layer of curd. Press for 45 minutes and then soak in a bowl of iced water for an hour. Refrigerate until ready to use. Pat tofu dry and cut into slices or blocks and dredge in brown rice flour. Pan fry until all sides are golden brown [This is easier to do if the initial shape is a cube.] 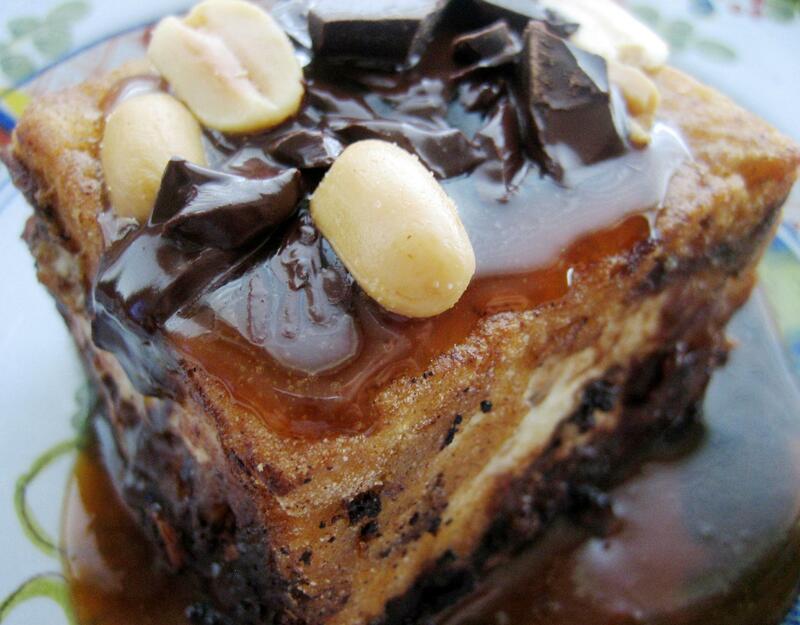 Garnish with caramel sauce, peanuts and dark chocolate chunks. Serve while warm and enjoy! That’s awesome! *pictures you on the kitchen floor licking a spoon with vegan caramel sauce and glazed eyes* heh. Enjoy. That looks absolutely amazing! I have some soft silken tofu in my fridge – can I use that for quickness? Toss the tofu into the food processor and add a tsp or two of vanilla extract and sweeten to taste with whatever sweetener you use. [Add 1/4 cup cocoa powder for chocolate] Make the caramel sauce and then drizzle that, the peanuts and chocolate chunks over the pudding. Yanno, this thought is evil because making a pudding like this would take, literally…10 minutes. What a deadly combination of things to have on hand. Do me a favor, or rather yourself one…Call a friend and tell them what you’re about to do so that when you go into sugar shock, rescue is near! Another question – if I use the soft silken tofu in the food processor, as you suggest above, can I then freeze it – will it turn into a sort of ice cream? Then I can cover that with warm caramel sauce….oh yes! Yanno, I’ve never frozen tofu like that, I would be afraid of it’s separating unless it had enough fat in it to keep it emulsified. Now that you’ve brought that up, I’ll give it a try and see what happens. Trust me, as the original blog titled it? It will change your life. Heh. Oh yes, I’ve been a fan of frozen banana ‘ice cream’ for a while – a video on YouTube of Dr Joel Fuhrman making it gave me the inspiration. He adds a touch of soya milk, and just blends it for a few seconds. Oh what a fun thread this is turning out to be! I agree! My mother, who is not vegan but is dancing around the edges of it, is coming to visit today for a week and my mind is racing with all the possibilities of things I can show her. Banana “ice cream” , silken tofu puddings and avocado chocolate pudding top the lists for quick and easy desserts. I feel like a kid in a candy store. Make these cookies for her as well: they will convert her to the cause! Do you think we ought to talk about some healthy food now? !